Ronald Comer has been a professor in Princeton University’s Department of Psychology for the past 27 years and has served as Director of Clinical Psychology Studies for most of that time. He is also currently the director of the department’s undergraduate program. Professor Comer has received the President’s Award for Distinguished Teaching at the university. His course "Abnormal Psychology" is one of the university’s most popular, and he has offered it almost every year since his arrival at Princeton. He is also a practicing clinical psychologist and serves as a consultant to the Eden Institute for Persons with Autism and to hospitals and family practice residency programs throughout New Jersey. Additionally, he holds an adjunct position as Clinical Associate Professor of Family Medicine at the UMDNJ–Robert Wood Johnson Medical School. 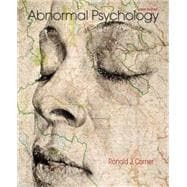 In addition to his abnormal psychology textbooks with Worth Publishers, Professor Comer has also published a number of journal articles in clinical psychology, social psychology, and family medicine. Professor Comer was an undergraduate at the University of Pennsylvania and a graduate student at Clark University. He currently lives in Lawrenceville, New Jersey, with his wife, Marlene, and their dog, Annie. From there, he can keep an eye on his sons—Greg, a resident of New York, and Jon, currently a Philadelphian—and on the resurgent Philadelphia sports teams with whom he grew up.